Vinyl binder using suede like material with fringe. 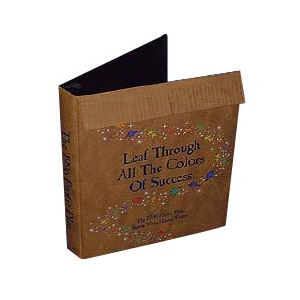 The product was RF stamped (debossed) with colored foil and multi color screening for added color. Disney was introducing the Pocahontas video to wholesale distributors and they wanted the packaging to reflect the Native American theme of the video. Fringe die cut from Tan Saba vinyl offered the connection between the film and the Native American theme they were looking for. RF stamping made the title striking yet appealing. The leaves blowing amidst pixie dust carried the theme from the main song in the video – Colors of the Wind.